Boiling meat in the pressure cooker can turn chewy nerves and ligaments from a cheap cut of meat into gelatin in about an hour. What really makes this dish unique is the rustic green sauce – a tangy bright acidic note that compliments an, otherwise plain, boiled meat. The Italian Bollito, boiled meat, is more of a technique than a recipe because the choices of meat to be cooked this way are vast but the results are always the same: tender and juicy. In Piemonte, the Northern Italian region that boarders with France and Switzerland, they bring boiled meat to a decadent art. The Piemontese have “official” Bollito Misto, mixed boiled meats, that is fit for a king’s medieval banquet. It is not “official” unless it entails seven cuts of Beef, seven types of meat and offal for additional flavor and adornment, seven sauces (Green Rustic, Green Rich, Red Sauce, Horseradish, Mustard, cugna, and Honey sauce) and five side dishes (Boiled Potatoes, Spinach and Butter, Mushroom Sautee’, Sweet and Sour Onions and cup of broth from the meat boil). Today, modern Italians with jobs and small impatient mouths to feed only use one to three kinds of meat, one or two sauces and any one or two side dishes – any from the above list will do -and they use the resulting broth sparingly with the meat and then save it for making a delicious risotto. 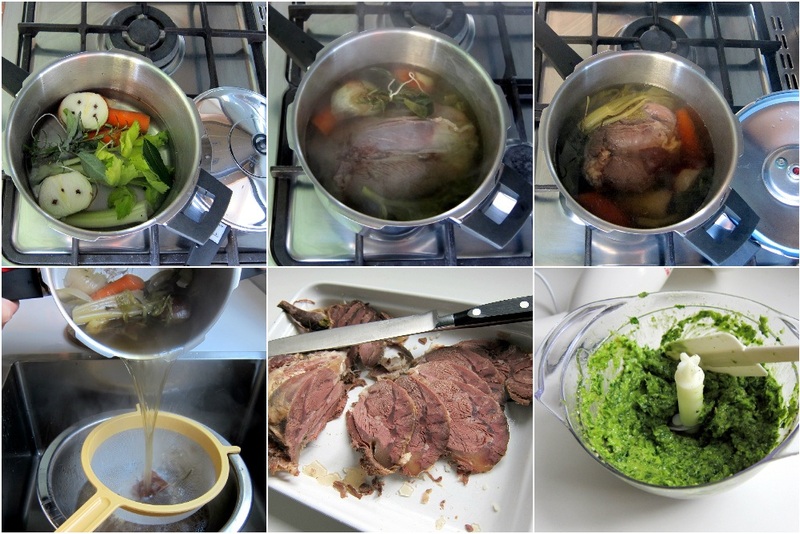 For an example of a simple boiled meat mix visit Frank, regular reader of this website and writer of my favorite English-language Italian cooking blog, to see how he makes Bollito Misto. When using a mix of cuts or meat, phase the meat into the pressure cooker according to it’s cooking time. Back to our simple one-meat boil, you can take inspiration from the Piemontese feast and use any of the cuts of beef, but since Europeans butcher animals differently from Americans it does not exactly work out to seven. Basically, you’ll want to use non-prime the Beef Cuts from the front or rear of the cow that are cheap, tough and full of ligaments, muscles and tendons. U.S.: Beef Round, Brisket and Shoulder (3 cuts). Europe: Rump, Silverside, Topside, Thick Flank, Leg, Shin, Brisket (7 cuts). Other meats and offal that could be added are: Veal tounge, Calf’s head, Ox tail, Ham Hock, Chicken (whole), Cotechino (offal pork sausage stuffed into pork leg) and Skirt Steak Roll. For this recipe, I only used one cut of beef, and it was a boneless piece from the leg (Round cut). A gluten-free and low-carb version of the Salsa Verde can be had by replacing the bread crumbs with the yolks from three boiled eggs. Anchovies are optional though you will not really taste them they just the extra depth they bring to the whole sauce. Before starting take the meat out of the refrigerator and set it aside so it can start coming up to room temperature. Prepare the pressure cooker with 6 cups of water, and add the carrot, celery, onion, bay leaf, salt and herbs tied into a bunch. Bring the contents to a boil, uncovered on high heat, and then carefully add the meat. If the water does not barely cover it, add more until it does. Bring the contents to a boil, again. Electric pressure cookers: Cook for 60 minutes at high pressure. Stovetop pressure cookers: Turn the heat up to high and when the cooker indicates it has reached high pressure, lower to the heat to maintain it and begin counting 50 minutes pressure cooking time. Set the meat aside in a tented dish, and reduce the broth, on high heat without the pressure cooking top, for about 5 minutes. Then, strain the stock and de-fat using your favorite method. I like to let the bowl cool in the refrigerator overnight so that I can easily remove the fat from the broth the next morning. The advantage of doing this is that the roast also cools and solidifies in the refrigerator making it easy to make thin slices. However, you can do all of this the same day though it will be challenging to slice warm meat. If you left everything in the refrigerator until the next day, de-fat the stock (it may have jelled- and that is a good sign). Slice the meat, place in an oven-safe serving dish and wet the meat (do not drown it) with the broth and warm through covered. Save the rest of the broth to use in a pressure cooker polenta or risotto! Pour the vinegar onto the breadcrumbs and set aside. Puree the rest of the ingredients together: Anchovies, Capers, Garlic, Parsley, Salt, Pepper and Olive Oil. Then, add the bread crumbs and puree' for about 30 seconds to combine. Continue adding more olive oil until you reach sauce consistency. This can also be made a day in advance and covered tightly in the refrigerator it will keep it's bright flavor and color 'til the next day. I recently bought a Wolfgang Puck Electric Pressure cooker, and it has changed my life! Went from a Pot Roast hater to a Pot Roast Lover! Soo incredibly delish! Lola, yes the pressure cooker opens you up to a whole new world of recipes that would ordinarily be out of reach because of their cooking time. Can’t wait to read what you pressure cook, next! Bollito with salsa verde is one of my very favorite things to eat! And you get excellent broth on top of it. I usually make the sauce without yolks or breadcrumbs, just ‘loose’ if you will, but next time I’ll have to try the breadcrumbs to see the difference. Ciao Frank! Somehow, adding the breadcrumbs soaked in vinegar seems to retain more of the vinegary flavor than just vinegar alone, when all is blended it emulsifies and makes a bit of a spread that stays put on the meat instead of running away and into the plate. First of all, the sauce is to die for!! I went around trying to put it on everything. This is an excellent recipe. I did a 4 lb. roast for an hour on high and it was just tipped to the slightly dry side, which makes me think I must have cooked it too long and too much of the moisture drifted into the braising liquid. Any tips on trying to find the “sweet spot” where the meat is falling apart tender before starting to get dry? So glad you enjoyed the sauce – it’s an Italian classic! The breadcrumbs really make the magic happen -they absorb the vinegar and other flavors and keep it from disappearing. If your meat goes a little over, slice it anyway while reducing the cooking liquid. Then, let the slices simmer a few minutes in the reduced cooking liquid to re-absorb some of their flavor. P.S. In Italian cuisine, There is a great “bread crumb” pasta sauce, that involves sauteeing garlic in oil then frying the bread crumbs in the mixture -add a little salt and finely chopped parsley sprig and… Wow! Laura, I’d love to try this recipe in my brand-new Instant Pot Smart. Are there any changes I need to make in the instructions, or should I just use manual and set it for 50 minutes? Use the longer pressure cooking time: 60 minutes. I have updated this older, classic, recipe with electric pressure cooker instructions. Hello, I would love to try this dish, in the main picture the meat has a caramelised appearance. How was this achieved? I can’t imagine as there is no browning the meat & it is warmed covered? Yes, as stated in the recipe the meat was wet with stock, covered and heated in a toaster oven before serving/photographing.